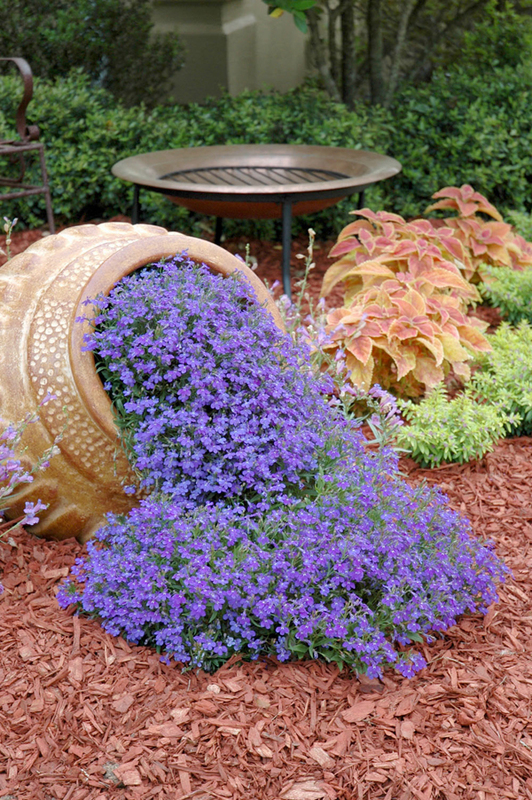 A spilled flower pot is a great way to spruce up your landscape. It’s whimsical and simply beautiful. This is also an easy way since a spill pot is planted just like any flower bed. The result is quite impressive, on the other hand. A spilled flower pot (also called a spilling pot or a spill pot) is an often broken decorative planter pot that is dug into the ground and slanted, filled and surrounded with blooming plants to create an effect of it spilling the flowers as if they were water. Choose a location for a spilled flower pot. It can be your garden or even a lawn. It will definitely add charm to your front yard and spruce up the regular lawn. Also consider what type of flowers you are planting. If they are shade-loving choose a place under trees or if they sun-loving plant them right in the middle of the lawn. For this project you will need a pot – it can be an old cracked pot, a water can, or even a bucket – and some potting soil. Prepare the chosen location by loosening the soil around the future spill pot. Bury your pot into the ground for about a half or less. Plant your flowers inside the pot and around it to create a spilled effect. Water your flowers regularly and maintain the spill pot by fertilizing them once in a while. If you want to have a beatiful bright spilling pot in a garden or on your lawn consider planting Callirhoe involucrata, wave petunias, violets, or Calibrachoa Superbells. If you want something more subtle small daisies are an ideal choice, but you can also plant succulents instead. I am absolutely trying the spilling pot this year, beautiful thanks and I think the superbells would be perfect for this. I love this project, stunning work. I will get the flowers and try it in my backyard. LOVE, LOVE, LOVE that spilling pot of flowers! I am definitely going to try this! I have the perfect spot for it too! Thanks so much!!! What is the name if the flowers in this picture of the spilling pot? Did you find out what the flowers were in the spilling pot? I love the look and I’m hoping they’re perennial. I believe they are Lobelia …I have also seen them in White ! Definitely trying this. I have already chosen the perfect spot. Lorretta, better to use annuals as the flowers will last longer. I have used succulents and they work well. I have a pot just like the one in the pic. How do you get the flowers all the way to the top of the opening like that? Do you put something in the pot to prop them up?